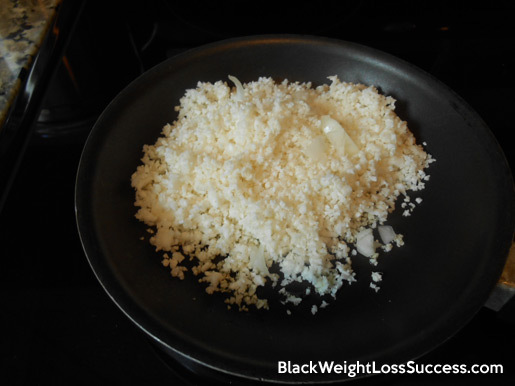 I want to show you how to make one of my favorite side dishes: Cauliflower Rice! I like to make this dish in a simple and straight forward way. I’ve eaten it heated, as well as unheated as a Vegan or Raw Vegan side dish. This dish is low carb, paleo and vegetarian/vegan (if you don’t use butter). Also, it is very low calorie compared to regular white rice. 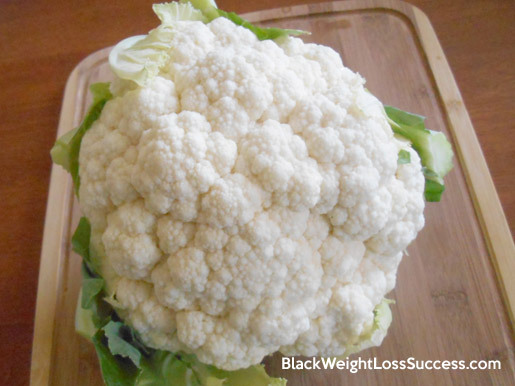 1 cup of cauliflower has 25 calories, 5.3 grams of carbs and 2.5 grams of fiber, compared to a cup of regular white rice with 204 calories, 44 grams of carbs and .6 grams of fiber. It can be served with any dish that is supposed to be served over rice, like stir fry and curry, or you can just have it on the side. 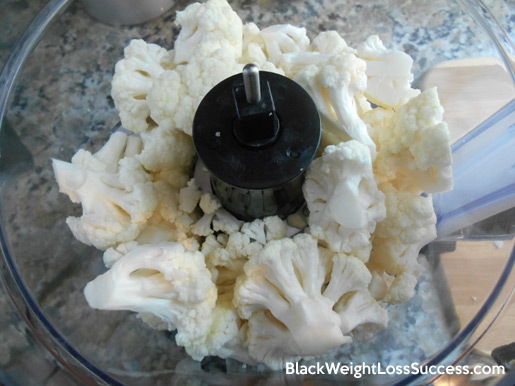 Today, I’m going to show you how to break down a cauliflower, chop it up with a food processor and heat it up on a stove top. Simple and Delicious! Let’s get started. 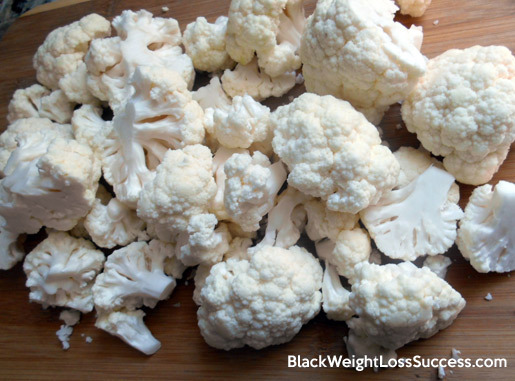 Prep Cauliflower by removing the leaves and stem. Cut the head into quarters and rinse. Place on paper towel and pat dry. Cut the quarters into florets the throw the rest away. In a medium sized skillet, add olive oil or butter and the onion and heat at the medium setting for one or two minutes. 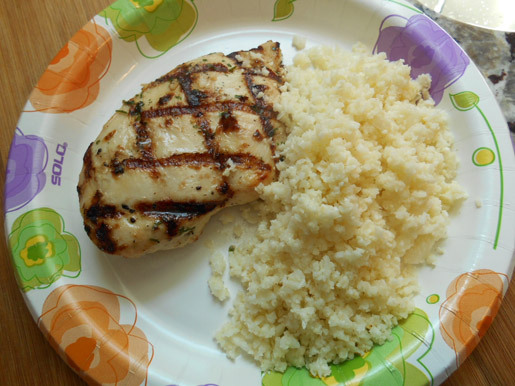 Add 1 to 1½ cups of cauliflower rice to the skillet. Cook for 5-9 minutes depending on how tender you want the rice to be. Stir while cooking and taste to find the desired tenderness. Remove from the skillet on to the plate. Season to your liking with salt and pepper and serve. 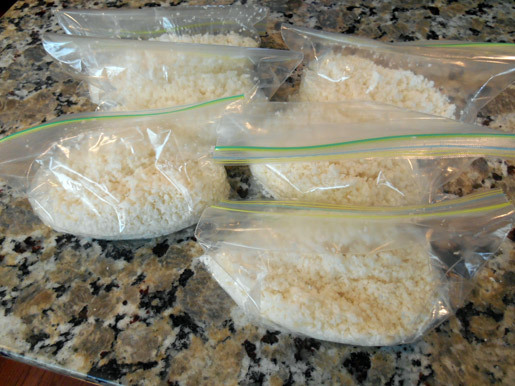 Put the rest of the rice in sandwich bags, one portion per bag, and freeze. Break it down! Set yourself up on a clean counter top or cutting board. 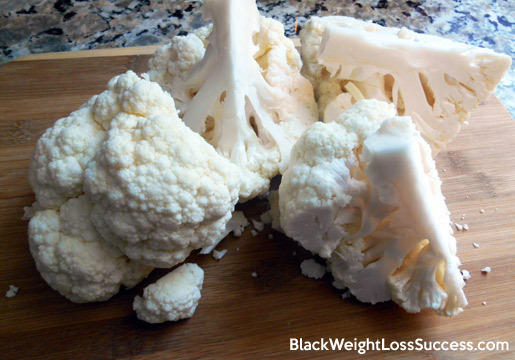 If you see any dark spots on the outside of your cauliflower, remove them first with a sharp knife. Next, you want to remove the leaves and stem. Next, you will cut the whole head of cauliflower into quarters so that you can remove the internal stem. Rinse the quarters with water, place them on a paper towel and pat dry. I prefer to use just the florets, but you can cut off just the bottom of the stem and use the internal stem if the cauliflower is fresh and tender. Your choice. 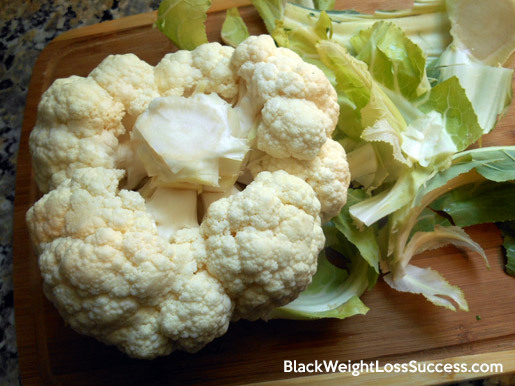 Note: Raw cauliflower can have a stinky smell when you chop it, just like broccoli. Don’t be alarmed. Now, it is time to chop up the florets in your food processor. I used the “Pulse to Chop”button. This allowed me to control the size of the “rice” grains. I pressed the button 3 times, checked the size, then pressed the button a few more times until the size was just right. Depending on how small you chop the cauliflower, you may be making cauliflower couscous, but that’s up to you. 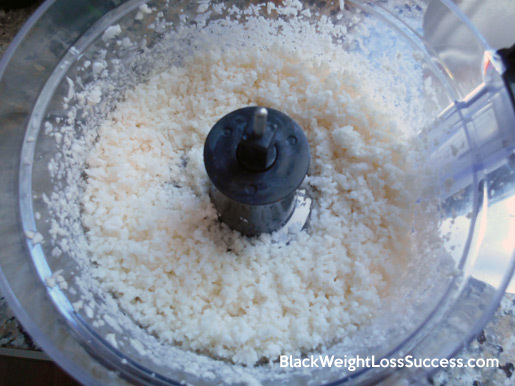 Tip: if you do not have a food processor, you can use a cheese grater/box grater using the side with the larger holes. After the cauliflower was chopped up to rice size, I knew that I only wanted to make 2 cups worth, so I put the rest of the rice in sandwich bags so that I could freeze 1 cup portions (packed down in the cup measure). I usually freeze these portions for up to 3 weeks. When I cook these portions, I will take the bag out of the fridge for about 5-6 min and let it sit at room temperature to unthaw a bit before cooking. Now, it’s time to cook! I added 1 tablespoon of olive oil and a handful of chopped onion to my medium sized skillet and turned the heat to medium. You can also use butter or coconut oil if you prefer. If you love buttered rice, I suggest that you use butter. Let the oil/butter and onion cook for about 1 1/2 minutes. 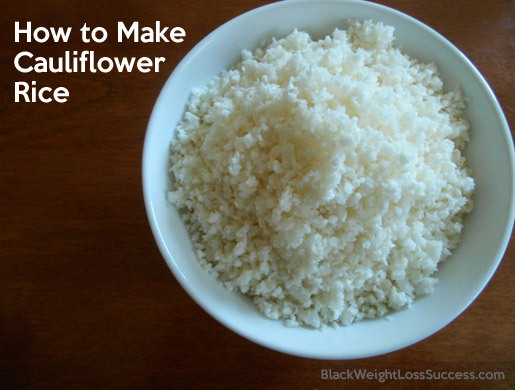 Cook the mixture for 5-9 minutes depending on how tender you want the cauliflower rice. You’ll need to stir it while it cooks and taste a little to check for tenderness you are looking for. I cooked this batch for about 6 minutes because I like my rice a bit firm. Here is the finished product with chicken breast on the side. Sprinkle with salt and pepper to your taste. You can also add things like green onion, sautéed mushrooms, herbs, etc…just as you would with rice. Considering the fact that I like rice, it isn’t good for my diabetes. I didn’t know that cauliflower could be done this way. Thank you, and I’ll be using this recipe to do this.